Riley Reid, a student majoring in Chemical Engineering and Physics, explains the newest fitness trend that has an environmental benefit, too. What is plogging and why is it called that? Plogging is a new form of activity that started in Sweden a few years ago that combines exercise with saving the environment. The idea is to jog while picking up litter in the area. It comes from the Swedish word “plocka upp” (meaning to pick up) and jogging. Tell us about plogging at NC State. This is the first organized plogging group at NC State. Plogging is for everyone: whether you’re an experienced runner or prefer walk/jogs. 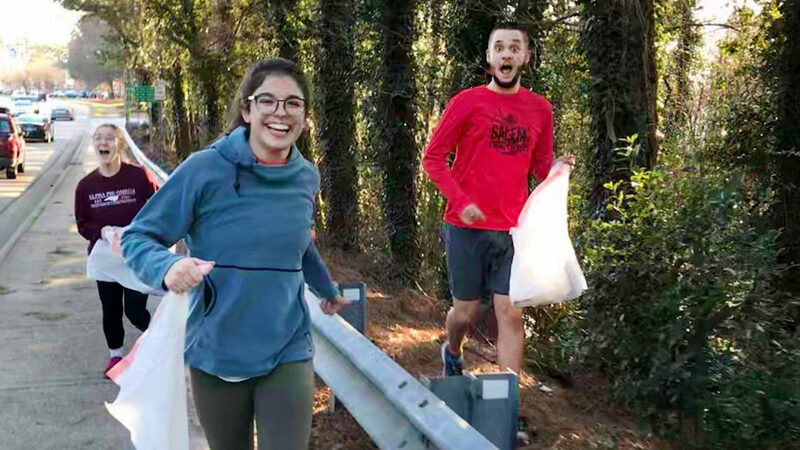 NC State and the surrounding Raleigh area is unfortunately covered in litter, and plogging is a great way to bring attention to the problem and start to make an impact. We plog every Tuesday at 5pm. Check the NC State Plogging Facebook page for more details. How exactly do you job and pick up trash at the same time? Don’t the bags get heavy and hard to run with? Normally, we plog with a small grocery bag, which ends up weighing a pound or two by the time it’s full. The size is small enough that it can be handheld and easy to jog with. However, if you’re looking for more of a challenge, you can try plogging with a full-size trash bag, which will get pretty heavy and give your arms a workout! It’s up to you how you plog, but with grocery bags is a great place to start. What if I’m not a fast jogger. Can I still go plogging? Plogging is for all paces. Some ploggers prefer to slow down to a walk; others even like to sprint between pieces of trash to get a more intense workout. We take easy-to-follow routes so everyone can go at their own pace. The goal of plogging is not to be an all-star runner; it’s to save the environment and have fun! Why do you love plogging? Plogging combines two of my favorite things: helping the environment and running. Plogging has also made me aware of the insane amount of litter we as a society leave in the environment without thinking twice. In addition, plogging has allowed me to meet incredible new people. I’ve gained a new community of people who are interested in being active and cleaning up their environment. Interested in plogging? NC State Plogging Facebook page has details on group plogs, which are currently Tuesdays at 5 p.m. on and near campus. Published in News, Newswire, Planet | Change Your State, Students, Waste Reduction, Wellness, Wellness | Change Your State, Zero Waste | Change Your State.